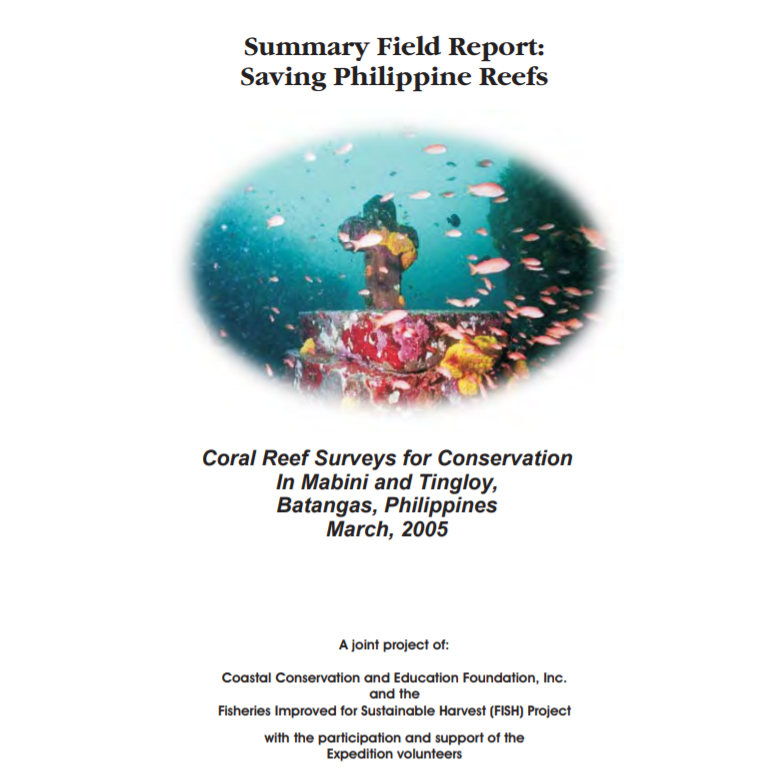 Abstract The Saving Philippine Reefs Project of the Coastal Conservation and Education Foundation, Inc., assessed and updated the coral reef condition at selected sites in Mabini-Tingloy, Batangas. Information on the changes in coral cover, other substratum, fish fauna, invertebrates, possible causes of coral damage over time, patterns and trends exhibited and reef health is provided. Recommendations are made for improved conservation and management of coral reefs to the Mabini-Tingloy management bodies, stakeholders, local government units and line agencies working in the area. Live hard coral (LHC) cover in Mabini and Tingloy areas ranges from poor to excellent (20.3% in White Sand Reef to 75.3% in Cathedral Reef Sanctuary at 7 to 8 meter depths). The overall physical condition of surveyed reefs appears improved in the shallow areas and an increasing trend is exhibited as seen in Cathedral that showed a 25.4% increase, from 53.8% in 2001 to 67.5% LHC cover. In contrast, a slightly decreasing trend is seen in deeper areas. Most decreases were observed in non-MPA sites. Surveys overtime indicated that human impact has largely contributed to changes in LHC cover rather than natural perturbations. In most non-MPA dive sites, boat anchor damage was apparent and this contributes to rubble. Fish diversity, abundance of target species and biomass are higher in MPAs compared to non-MPAs. This reflects the overall good management and enforcement of these sanctuaries. For instance, Batalang Bato (formerly Pulang Buli Sanctuary) had the highest biomass (93.87 kg/500m2) compared to the rest of the sites. However, abundance and diversity of butterflyfish and angelfish appeared lower compared to previous years in certain sites such as Cathedral Rock where only 5 species were spotted as compared to the 19 species seen in 2001. The highest increase in species was at Sombrero Island, with 17 species (in 2001) to 23 existing species identified this year. These patterns indicate the possibility of poaching inside some sanctuaries and/or high fishing pressure of both target and aquarium fish in adjacent fishing grounds. Overall, more fish species were listed from 327 species in 2001 to 368 species in 2005. In non-MPA sites, although LHC cover may be fair to good, there is an alarming lack of target species as well as a lack of large fish. Target species were especially low in density in most areas with the lowest at White House Reef (non MPA) 18.0 individuals/500m2 and the highest at Batalang Bato Sanctuary (MPA) 267.2 individuals/500m2. Results showed that although most sites showed increases in all reef fish; size decreases (Cathedral Reef Sanctuary, for example, had a 77.3% decline in target fish since 2001). It was only in a well-managed sanctuary as Batalang Bato (Pulang Buli) that the target fish showed a 153.2% increase since 2001. Despite this, there was still a significantly higher biomass of target fish in MPA sites as compared to non-MPA sites. Overall, the survey expedition documented the MPAs, and new MPAs, with important changes in their reef health and fish abundance and species diversity. Recommendations for improved and sustained management include the need to: (1) enhance management efforts in Cathedral Rock and Arthur’s Rock sanctuaries, (2) educate and inform dive resorts, dive guide and tourist divers about CRM and the proper use of marine sanctuaries (3) install more anchor and mooring buoys in Layag-layag, Sombrero Island and Sepoc Point Reef, (4) establish more sanctuaries to provide benefits of recovery to heavily fished areas, (5) develop an integrated, long-term management plan for the Mabini and Tingloy area combined.